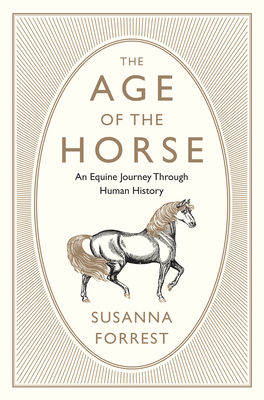 An essential book for anyone who's ever been captivated by horses, The Age of the Horse is a breathtaking exploration of the enduring connection between humans and Equus caballus. Equestrian expert Susanna Forrest presents a unique, sweeping panorama of the animal's prominent role in societies around the world and across time. Fifty-six million years ago, the earliest equid walked the earth--and beginning with the first-known horse-keepers of the Copper Age, the horse has played an integral part in human history. Combining fascinating anthropological detail and incisive personal anecdotes, Forrest draws from an immense range of archival documents as well as literature and art to illustrate how our evolution has coincided with that of horses. In paintings and poems (such as Byron's famous "Mazeppa"), in theater and classical music (including works by Liszt and Tchaikovsky), representations of the horse have changed over centuries, portraying the crucial impact that we've had on each other. Forrest deftly synthesizes this material with her own experience in the field, traveling the globe to give us a diverse, comprehensive look at the horse in our lives today: from Mongolia where she observes the endangered takhi, to a show-horse performance at the Palace of Versailles; from a polo club in Beijing to Arlington, Virginia, where veterans with PTSD are rehabilitated through interaction with horses.